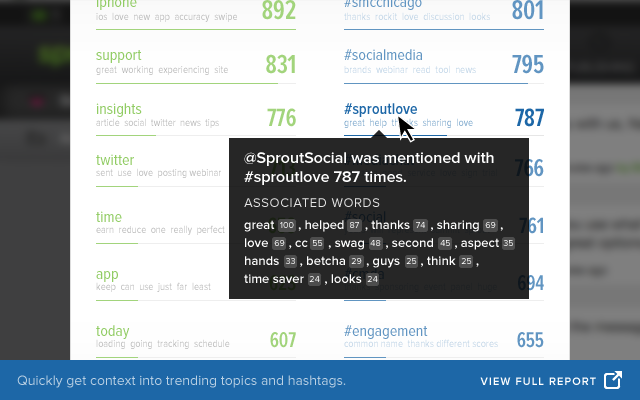 Sprout’s new Trends Report gives you insight into what’s being said to your brand on Twitter—and who’s saying it. 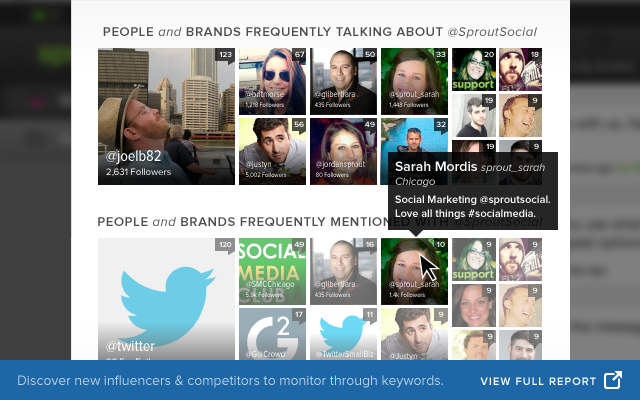 For each of your connected Twitter profiles, Sprout will automatically analyze all of your incoming messages to show the top topics, hashtags and influencers mentioned with your profiles. Whether it’s an increasingly common customer service issue, the response to your new marketing campaign, or feedback about your latest product launch, we’ll help you identify and stay up on social trends applicable to your brand. Track your social trends or see us in action by requesting a demo today. For each profile, without any setup, you’ll be able to see what people are commonly talking about when they mention you on Twitter. The report shows you how many times each word, phrase, or hashtag was mentioned that month, as well as the top words that were used with that topic or hashtag. Simply hover over the topic or hashtag to see more associated words, and understand more of the sentiment behind what’s trending. You can immediately get even more context by clicking through to view all tweets containing that topic or hashtag. 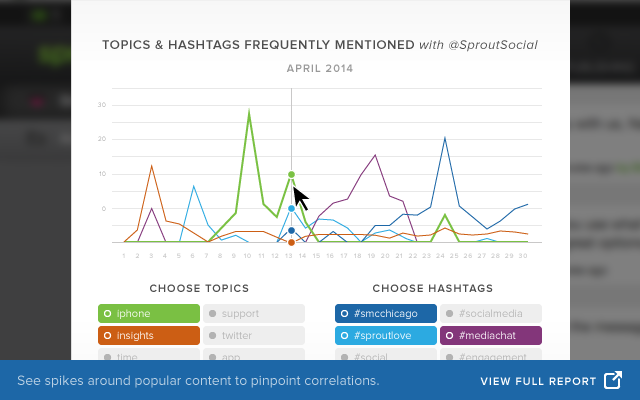 Want to see how mentions of certain topics have increased over time? Or isolate when usage of a specific hashtag spiked? Select topics and hashtags to chart relationships, correlations and patterns—making it easy to see, for example, that mentions of iPhone spiked when you talked about your new app at an event weeks after you first launched it. Knowing what people are saying is important, but it’s only part of the story. The Trends Report also highlights two sets of people and brands. First, you see people and brands that are frequently talking about you. These could be passionate customers, influencers in your space or people that are affiliated with your brand. Second, you see people and brands that are frequently mentioned with you – peers, competitors, associated individuals, and more. Click on any Twitter profile to view the contact page and learn more about any previous interactions. You may even get some ideas for new brand keywords to track! It’s more important than ever to incorporate smart, active social listening into your strategy. We hope this new report makes it easy for you to monitor what people are saying to your brand and help you make better decisions that increase engagement. 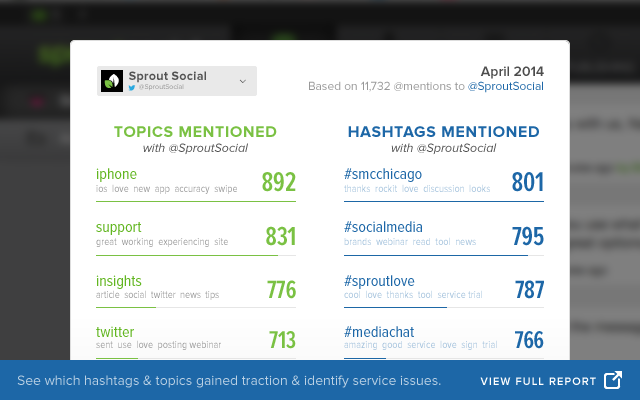 Learn more about Sprout Social’s Twitter management tools and additional features here.